Steve's Blog: Back from honeymoon! Its been a busy couple of weeks! 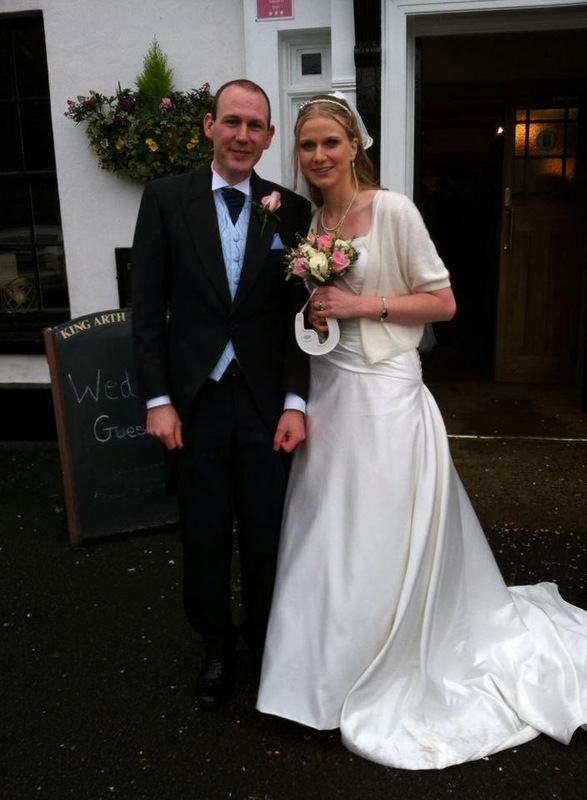 Mel and I were married on Saturday February 1st at the King Arthur Hotel in Reynoldston. Everything seemed to go off without a hitch and we thoroughly enjoyed the day. Big thinks to all of our friends who could make it, and pretty much everyone seemed to be up and dancing at the twmpath in the evening! A lot of planning went into it and it certainly paid off, can't wait to see the photos (there are loads on Facebook and we must chase people to get the originals. We're waiting on seeing what the official photographers have done but I must say they were excellent on the day. We headed off for our honeymoon in the Canadian Rockies, leaving Cardiff in the early hours of Monday 3rd. We arrived at the airport rather a tad early, but better early than late! Our flight went via Amsterdam with around a 4 hour stopover so we figured we'd get some time to look around there. We had intended to have a look around the flower market while we were there, but that proved rather too far. After catching the wrong train and then managing to get on the right train with the help of a friendly guard, it was simply going to take us too long to walk from the central station - we got about half way there before we decided we were going to have to turn around and head back to the airport. Having spoken to other people since, it seems we should've caught the tram instead of the train as it would've been much much quicker. Never mind - it was good to get out and stretch our legs before the long flight to Calgary anyway. I have to say I was quite impressed with KLM - they provided regular meals on both the Cityhopper to Amsterdam, and the flight to Calgary... because of the 7 hour time difference between the UK and Calgary I have absolutely which meals of the day they provided, but we got about four of them in all! :) Usually I've flown on cheap European charter flights where you get no food and drink unless you pay through the nose for it, so it was quite refreshing to see this handed out to everyone as a matter of course. Unfortunately it seems that Thrifty aren't too good at keeping their promises - initially they didn't have a car for us at all, so we had to wait around. They then found one but said it didn't have winter tyres - we reiterated that we needed them because some of the roads we were going to be driving on had legal requirements for such, so they set about trying to find us another car. Eventually we were told they had a bigger car with winter tyres, handed over the keys and charged us the daily winter tyre fee - so we're off! Except we're not... a quick check of the car shows no winter tyres, so back to the office - they now say that as it was a slightly bigger car then that should be enough and we don't need the winter tyres. Apparently the roads we intended to drive are "not that bad"... So not only have they told us to ignore the law and drive without the right equipment, but they have charged us for equipment that they aren't providing, and then lied to say they were providing it! We were starting to get pretty unhappy by this point and time was ticking away. Eventually they found us yet another car (a Toyota Camry) - the tyres on this carried M+S (mud & snow) markings, which was rather disappointing - winter tyres have a "snowflake and mountain" symbol and although they are designed to deal with snow, M+S tyres aren't truly winter tyres and don't necessarily cope so well with such low temperatures. However, as time was now truly ticking on we decided to cut our losses and accept what they had given us. It was now 16:30 - 2 hours after we were supposed to have picked up the car, and it was rush hour in Calgary. Another thing we weren't happy about is that Thrifty were insisting that even though we had booked and paid for an "insurance excess waiver" with Car Del Mar, we had to pay again directly to Thrifty and claim that fee back from Car Del Mar. This isn't at all how it was explained to me by Car Del Mar - they had originally said that they would simply refund any excess we had to pay, but as Thrifty were insisting that this wasn't the case, we ended up going along with it. So a job I still have to do now we're home is write to Car Del Mar and ask them to refund this fee. With the additional rush hour traffic, we didn't even get out of the city until after dark. Driving conditions weren't great - we had drifting snow and this was making driving very disorientating as it looked like you were driving over a constantly moving road surface. Intermittently, the snow was covering all the road markings, and because of a covering of snow over everything, it was impossible to distinguish where the edge of the road was. Suddenly I realised I had no idea what my current road position was, and started slowing down and trying to figure things out. Somehow I decided I was too far to the left, so moved right slightly... straight off the side of the highway and into deep snow! Because the ground sloped away from the highway slightly and the snow was quite deep, we couldn't drive the car back onto the road - with my snow chains on it would've been no problem, but the M+S tyres they had put on the car were completely hopeless. So there we were, stuck in < -30°C temperatures, in a blizzard off the side of the highway... great, not what we wanted for the start of our honeymoon. Helpfully another motorist stopped to help. 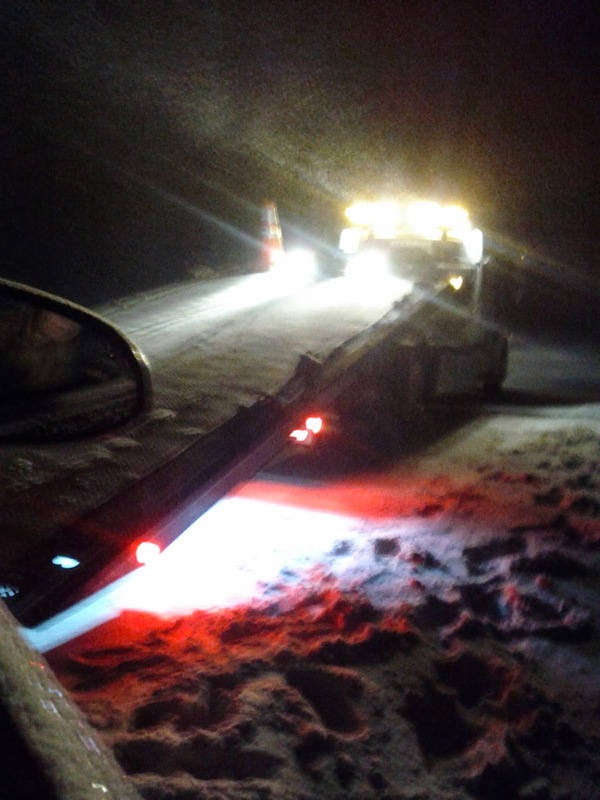 He didn't have a tow rope, but offered to give us a lift to Canmore where we could get a tow. While we were talking with him, another motorist stopped who did have a tow rope, but we then discovered that the Toyota Camry didn't appear to have any kind of front tow eye and the manual didn't mention anything about towing at all. Just then a police car stopped and called for a tow truck for us, who turned up within half an hour and quickly pulled us back onto the road, charging us $380 CAD for the privalidge. Expensive, but at least we were on our way again. We finally rolled into Banff and found our hotel a bit after 21:00 - exhausted, we just rolled straight into bed for a good night's sleep. Another couple of comments about the car while I'm on the subject - firstly it had a foot operated parking brake about where you'd expect to find the clutch on a manual: bad news! But also the parking brake was impossible to see in the dark of the footwell, so to those of us not used to it we were forever peering down there with torches to try and find it to release the thing - what's wrong with a good old fashioned handbrake?! Secondly, I've not driven an automatic before, but this seemed to like sitting in the highest gear possible. Fine for cruising, but when you're pulling out and spot someone heading towards you and want to get out of the way quickly, putting your foot to the floor and feeling nothing at all happen for about 3 seconds until the car decides it needs to change down is... unnerving, to say the least! Give me a car with a proper gearbox any day. We started our day with a simple breakfast - toast, cereal, coffee. Since we were only spending a single night in Banff, we had largely picked our hotel for its cheapness - we had a private room in The Banff Y Mountain Lodge - this is a hotel / hostel for travelers run by the YWCA, with the profits going to support the charity. We had a standard double room with en-suite bathroom and it was a pretty reasonable affair - I guess I'm not a hotel snob, but I couldn't see anything I was unhappy about and all for $69 CAD for the night, which included the breakfast. After discovering an apple we'd accidentally left in the car was frozen completely solid, we had a short wander around Banff itself, which seems to be a lovely, very picturesque town, and then set off up towards Lake Louise and then onto the Icefields Parkway. It winds up through the Rockies, takes you from Lake Louise to Jasper and was actually a much better road than we expected - although there were patches of ice and snow on it, it was ploughed and quite wide. The speed limit was around 90 Km/h on most of the road and we found the driving pretty relaxed. There were fairly regular stopping places for viewpoints, walks, etc. We didn't think we had enough time to go for a walk as we wanted to get to our destination in the daylight, but we did stop quite a few times and have a short wander round. Some of the stopping places are off-road carparks, which were too deeply covered in snow to drive into (although we could usually park in the turning into the carpark, leaving us off the highway so as not to be a hazard), but there were also plenty of large lay-by style parking spaces at the side of the road, which were obviously well used and only covered by a few cm of packed snow, so not a problem to drive onto them and park. There was fairly minimal traffic - we did large stretches of the road without another car in sight, but there were enough other cars around that we were happy that if we got into trouble we wouldn't have to wait long for someone to pass by. No wildlife spotted on the drive, other than a few ravens, but plenty of mountains. Stopping off in Jasper to pick up supplies we headed on to our accommodation for the first four nights - the aptly named Gingerbread Cabin. It was a really nice cabin, a few minutes outside the national park boundary, in Folding Mountain Village - basically a single road with about 25 cabins along it of all shapes and sizes. The cabin was really well provisioned and a good size - you could happily take a family there, with three double beds (one in its own room on the ground floor with an en-suite bathroom and two in the mezzanine style loft, a large living room with a wood burning stove (but there was central heating too). Full cooking facilities - hobs, ovens, microwave, coffee pot, kettle, etc. and we were really very comfortable. Through the front windows were nice views of the mountains to the south, and the north side looked out into a wooded area. There weren't really any footpaths near the cabin itself as far as we could tell, so we drove into the national park each day. We got a quick phone call from the cabin owners to check we had arrived safely almost as soon as we arrived, which was nice. We tended to have fairly lazy mornings, heading out just before lunch on most days and doing a bit of low level walking in the afternoon. We awoke on Wednesday 5th February to see the thermometer outside our bedroom window showing -30°C. A quick wander up to the top of the road and back confirmed that yes: it was indeed pretty nippy, and we went back indoors to put on some extra clothes. Once properly dressed for the conditions, we found the temperatures pretty much fine - in many respects the dry -30° seemed nicer than the usual damp 8° we've been having in the UK. The first challenge was figuring out how to lock the door! The front and back doors were equipped with doorknobs with locks in the centre of the knob itself. This appears to be pretty common in North America, but the cabin owners acknowledged that Europeans struggle with them. In the end we gave up and left the cabin unlocked, expecting the crime rate to be pretty low given that it was pretty much in the middle of nowhere. Later on we discovered that you need to push and turn the inside handle and then pull the door closed. Having stopped to photograph some deer along the roadside, we drove to the car park next to the first bridge across Maligne Canyon where there's a cafe (closed in winter) and had sandwiches and coffee in the car. Maligne Canyon is a deep slot canyon, through which the Maligne River flows, including a series of waterfalls. We were surprised to see that it was recommended to pay a guide, but actually the walking is really easy going on well a trodden signposted path so we just made our own way. The estimated times given for the walk seemed somewhat slow and in the end we actually went a lot further than we had expected to given the estimated times on the signposts. Since this was all well made paths on fairly flat terrain, we hadn't bothered to take crampons and walking axes, although we did make use of our Petzl Spikeys since it was quite slippery in places. In the summer, there would be raging waterfalls flowing through the canyon, but for us they were beautifully frozen and we saw a couple of ice climbers having a bash at one of them, leaving us wishing we'd got our ice climbing gear with us (which we were unable to take on holiday due to weight limits). At a particularly low part of the canyon wall, we climbed through the railings and had a careful walk up the frozen river - crampons would have definitely been a good idea at this point, and as if to prove it, Mel slid over and landed quite heavily, leaving a large bruise. After going as far as we thought was sensible, we turned around and headed back onto the footpath. In the end we went as far as the fifth bridge, where the water was liquid and flowing freely, before heading back along a higher level path, which as it turned out was much quicker and we were back at the car in no time, having spotted and said hello to a red squirrel along the way. There are a number of lakes on both the East and West of Jasper, so on Thursday we had lunch next to Pyramid Lake and then went for a walk next to Patricia Lake. It was considerably warmer and we both found we'd taken far too much clothing for the -16° temperature. Both lakes are to the northwest of Jasper and we parked next to some horse riding stables to the east of the lake. The walk was very pleasant and we extended it a bit towards Riley Lake - there are a lot of footpaths criss-crossing the whole area, so quite easy to change your route as you go along. About half way around, we started spotting some kind of black "fur" on a lot of the trees - I think this was probably some kind of lichen, but by the end of the walk Mel was getting quite paranoid that we were about to stumble upon a bear. Of course, this didn't stop her later making an "it's so cute" remark at a photo of a bear! An especially lazy day on Friday 7th - although we had thought about heading up Whistler Mountain, in the end we spent much of the day indoors lazing around doing a jigsaw puzzle. However, we did make it out late afternoon and went over to Mildred Lake, to the East of Jasper. The Fairmont hotel maintains a skating rink on Mildred Lake and hires skates for about $11 CAD (if you've got your own skates you can use the lake for free). There's a circuit cut around the outside of the lake, probably about half a kilometer or so in circumference, and then four hockey pitches in the middle. Having not skated on a lake before, I was surprised to see how bumpy it was - lots of cracks, which make skating a bit like rollerblading on the pavement - you've got to be ready for one of your skates to hit a crack and stop. The cracks going across the track weren't too bad but the ones going along in the same direction as the track were perfect for your skate dropping down unexpectedly - especially problematic after dark when you can't actually see the cracks! The cracking sound as you skate around was also slightly disconcerting, but the ice was transparent enough to see that it was at least half a metre thick so no chance of falling through. Friday night was our last night at the cabin, and on Saturday we left and headed back down the Icefields Parkway to Lake Louise. We had had a really good time in Jasper and we had seen a squirrel and a rabbit behind our cabin, and deer, elk (or caribou?) and a wolf as we had been driving around. As we drove towards Jasper, we were able to stop near to a herd of goats who were grazing at the side of the road. Much like the drive up the Icefields Parkway on Tuesday, we had a pretty relaxed drive in good weather, stopping off a few times on the way. One of the more interesting stops was at Athabasca Falls. The Athabasca River flows over a large chunk of Canada and the water eventually discharges into the Arctic Ocean. The falls looked quite impressive in their frozen state. We arrived at Lake Louise at a reasonable time, checked into the Deer Lodge and Mel rented her skis from the Fairmont Chateau, which seemed as good a price as any - ski rental seems to be quite expensive compared to Europe, but they were probably a little cheaper than we expected. Then down to Lake Louise Village to get some grub, which was a wholesome fish & chips for me and a "mountain burger" for Mel, which disappointingly wasn't an actual mountain in a bun. A stereotypical Canadian breakfast had to be done - very nice pancakes with blueberries and maple syrup! The Deer Lodge ran a shuttle bus between the hotel and the ski resort, which made things easy for us - we didn't have to bother about driving. We quickly found that they were a bit short on snow - whilst the snow report claimed a base of about 1.5 metres, there were definitely thin patches on the pistes, especially the steeper ones, with quite a few rocks and mud patches showing through. Skiing was largely good on the greens and blues, although you had to keep your eyes peeled for rocks sticking through. I ventured on a black almost immediately and discovered it was sheet ice with moguls - I picked up a few bruises and decided to stick to greens and blues for the time being. By the end of the day we were back to doing a few blacks though. There was a temperature inversion, which is apparently very common in Lake Louise, making it -28°C at the base and around -15°C towards the top. Consequently we were getting quite warm at the top and then suffering from slightly cold fingers and toes at the bottom. In the afternoon we made use of the "Ski Friends" service - a bunch of volunteers who do free ski tours of the mountain. We picked the "blue" group, who kept up a reasonable pace which we were both quite happy with and it proved useful to show us around the mountain a bit. We both ended up with quite cold fingers though and discovered that our air activated chemical hand warmers... errm, didn't. I'm not sure if they were just old or something, but we opened several over the course of the week and none of them got more than very mildly warm. Back to the hotel after a good day of skiing, and Mel discovered she was starting to get the very early stages of frostnip - very very dark blue toes, which worried us a bit. However, after rewarming them in cool water, they returned to normal colour and apparently no ill effects except for a mild loss of sensation on one of the big toes - something for us to keep an eye on for the rest of the week though! Before dinner we felt we had to give the hot tub a go - the hotel had one in the open air on the roof. Care had to be taken when entering it because there was a lot of sheet ice on the floor, but once immersed it was lovely. In fact, a tad too hot and we intermittently had to sit on the side out of the water to cool off, which is an interesting concept in -30° temperatures - I had interesting problems with my swimming trunks freezing to the ground! Very relaxing though, and amusing conversation with the other hot-tubbers. Quite a nice dinner, although I might say a bit too "fancy" for my tastes - I mostly like reasonably simple grub in large portions. Monday morning and after eggs benedict for breakfast for me, and granola and yogurt for Mel, back out onto the slopes and we were getting comfortable with the pistes and doing a mix of greens, blues and blacks. I was eyeing up the double-blacks, but they were looking a bit too gnarly with the lack of snow - very hard packed, icy and with rocks and bare patches in places, so we steered clear. We broke early for hot chocolate and cookies to check on Mel's toes - we didn't want a repeat of the previous day's blue toes. Then back on the slopes for a bit, a late lunch, then more skiing. We were both finding all the runs quite acceptable, if a little icy in places, and we were both keeping up a reasonable speed, even on the steeper stuff... There was talk of possibly some new snow heading our way too. We kept a similar pace on Tuesday, exploring the Lake Louise ski area more and ticking off lots of runs. It started to snow in the afternoon, which was only going to be a good thing, and continued until the evening, stopping while I was still sitting in the hot tub. 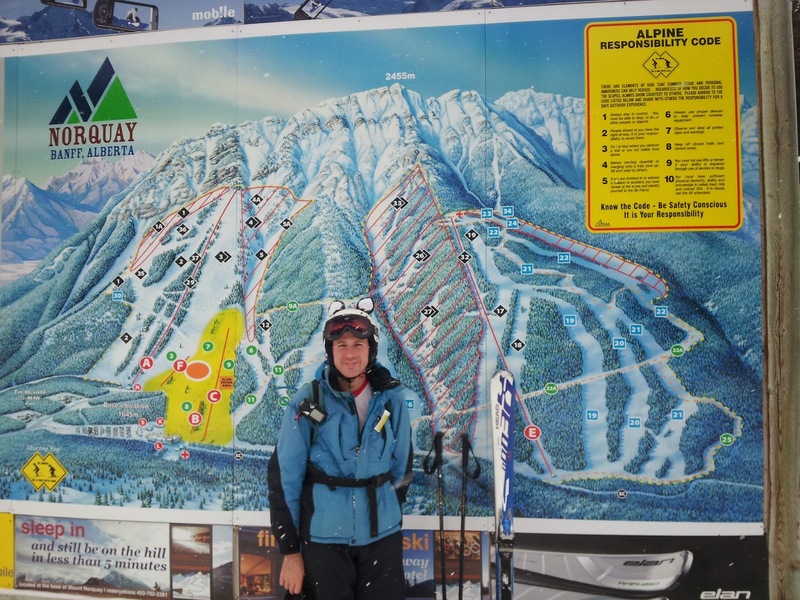 We had decided to head to the Norquay ski resort at Banff on Wednesday - leaving the hotel we realised there had been quite a fall of snow overnight. However, once we had driven to Norquay, it was apparent that although there was more snow than at Lake Louise, they hadn't had nearly as much as we had seen at our hotel, so we questioned whether it had been such a good decision. However, the visibility wasn't great at altitude so we concluded that actually Norquay may well have been better skiing conditions than the higher altitude Lake Louise. Anyway, we were there and we were going to enjoy it! Before lunch time, we were eyeing up Memorial Bowl - a black run on the edge of the resort - slightly challenging but it was a lovely run with largely untouched powder over reasonably gentle moguls. At the bottom it split into a run through deep powder and trees and an easy track across to the bottom section of an adjacent black. Mel opted to take the track and I discovered that you get a lovely fresh pine scent when you're face first in a tree in knee deep powder trying to figure out how to reach the bindings of your skis to remove them and dig yourself out! After lunch we did an adjacent black, and then rather than walking around to the other lifts we decided to go up again and try our luck on "The Lone Pine", a double black. It was steep, heavily mogulled, but the snow was good and we didn't have too much trouble. A few easier runs for the rest of the afternoon, although I did discover a grand slalom set up on the shallower section of another black run so had to give it a go. With it still snowing, as it had been all day, we headed to the upper hot springs in Banff for some relaxation. Somewhat cooler than the hotel hot tub - in fact, a rather more pleasant temperature, at around 39°C I think they said. The pool is fed from hot geothermal springs, and open to the air so you can relax, floating in the water with the snow drifting down around you, watching the mountains all around - amazing. We noted a sign saying "maximum recommended time in the pool: 10 minutes" and promptly ignored it, much like everyone else seemed to be doing, and had a good hour or so to ease the aches and pains. I had been having pizza cravings, so we went to find an Italian restaurant in the town before heading back to the hotel. On the way back, Mel noticed a quite severe vibration through the whole car, but after getting off the highway at Sunshine and examining the car by torch light, we couldn't find anything wrong so carefully continued driving. The vibration was still evident later in the week, although had vanished by the time we drove to Calgary on Saturday - the weather had become much warmer by that point, so I suspect a large lump of ice had become attached to one of the wheels or something similar, and had presumably melted off by Saturday. It continued to snow through Thursday and Friday and the snow conditions were greatly improved on the ground - we were now happy to tackle the double blacks which were dotted all around Lake Louise, especially in the back bowls and we both became very accustomed to taking off-piste trips through the wooded areas, although this did result in me gaining a few large bruises from clipping trees when misjudging turns. Its noticeable that Canadians have a much more loose idea for what constitutes a piste than the Europeans - in Europe, if something is marked on the piste map then it's usually signposted and well marked on the ground. Not so in Canada: many of the runs on the piste map aren't marked at all and you simply know that "in that wooded area there are 3 black runs", so you make your way into the trees and figure out your own way down. Still, all good fun. I should also mention that North America has a slightly different grading system to Europe - in Europe we have green (although Austria doesn't have greens), blue, red and black. In North America there are green, blue, black and double black. I'd say that a Canadian green is roughly equivalent to an easy European blue; a Canadian blue is something like a European hard blue or easy red; a Canadian black is somewhere around a hard European red or an easyish black and double-black is anything harder than that. I didn't really see any slopes in Canada that would be equivalent to a European green, except for the bunny hill (beginner slopes). We set off slightly late on Saturday, but did get chance to call in at Banff for a quick bit of souvenir shopping on the way. I set off the metal detectors at Calgary Airport and was invited for a choice between a pat-down and a trip through the body scanner - I opted for the pat-down but the security guard then tried to persuade me to take the scan by telling me it was "only ultrasound"... 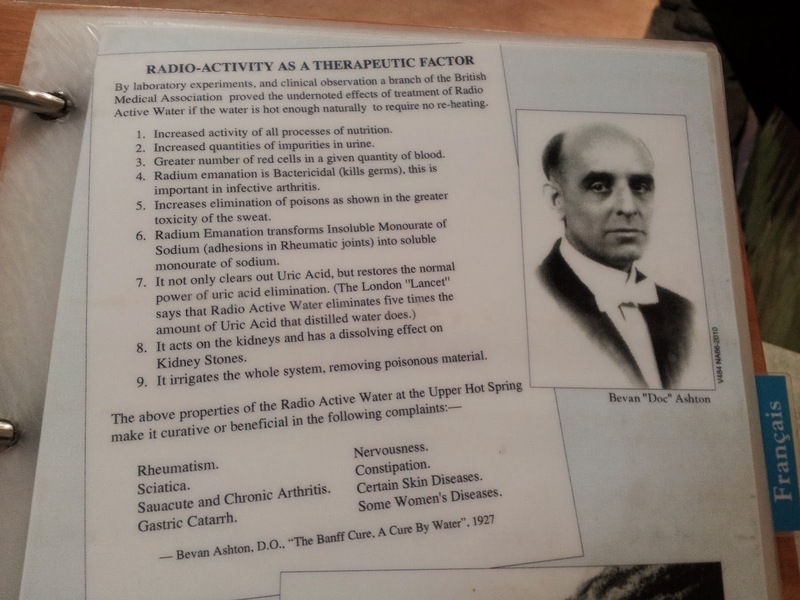 I knew this was untrue, but after a look at the scanner I saw it was only a sub-millimetre wave scanner so I agreed (if it had been a backscatter X-ray scanner I would've flatly refused). All reasonably plain-sailing after that on the flight to Amsterdam - again, we were treated very well, although not so much food as we'd had going out - presumably because we were flying over night. I did end up having a couple of free glasses of wine though, in the hope it might send me to sleep... it didn't. If anyone tells you that you can sleep on a plane, don't believe them! We got to Amsterdam about 30 minutes early, which was nice since we were only expecting a 1 hour stopover. Slightly odd that you have to go through security again to get on the next flight, even though you've only just got off a plane. After boarding the plane to Cardiff and watching the exits being pointed out to us, the pilot cut the power to the engines and announced that there was a "technical problem" and that an engineer had been called. After much banging and whirring, we were told that the problem was bigger than expected and were moved to a different plane. The second plane got us to Cardiff on Sunday morning without any more problems, although obviously rather later than expected since our takeoff had been delayed by an hour. Unfortunately it seemed our checked bags hadn't made it out of Amsterdam. Our luggage did arrive in Cardiff on Sunday evening and was couriered to us for Tuesday, although luckily we hadn't got anything we urgently needed in those bags. All in all a very enjoyable trip!